The Jumbos participated in an impromptu geography lesson to kick off their Fall season, setting sail all across New England in an action-packed first weekend. The team participated in six regattas between Saturday and Sunday, bringing home solid results despite shaking off some of the summer rust. Senior co-captain Ian Morgan was part of the Jumbos’ team at the Harry H. Anderson Jr. regatta at Yale for the “Connecticut leg” of the weekend. Tufts sent both A and B fleets, who collectively placed eighth out of 16 teams in the field. Tufts’ notable performances at Yale included a second-place finish for the B team in the tenth race of the weekend and third-place results by the A team in the 13th and 15th races to finish on a strong note. Senior co-captain Jack Bitney headlined Tufts’ performance in Maine’s frigid waters at the Penobscot Bay Open, hosted by Maine Maritime. Despite a cold northerly wind, Tufts sailed its way to a second-place finish out of 11 competing teams. The B fleet led the Jumbos’ effort, managing a cumulative score of 27 points over 13 races — best of all 11 teams competing in the B division. Bitney stated that the team had to deal with challenging conditions but could be pleased with its overall performance. On its home course at Mystic Lake, coach Ken Legler’s hosted the Tufts University Invitational on Sunday. Two Tufts teams — each with A and B division participants — sailed in the regatta, with “Jumbos 1” placing second and “Jumbos 2” finishing sixth. The former’s A division team, skippered by sophomore Wells Drayton with first-year Jessica Friedman as crew, garnered in an impressive score of 44, highlighted by three first-place finishes in just nine races. Tufts also participated in the Harman Cup over the weekend, another two-day regatta at Maine Maritime. The Jumbos finished the event in fourth position after losing the head-to-head tiebreaker to local rival Northeastern. Just one fleet sailed at the Harman Cup, with senior Sam Shea skippering and the triumvirate of first-year Ansgar Jordan and sophomores Bram Brakman and Lindsay Powers on crew. Despite only competing in just eight races, the team managed to string together a trio of top-three finishes. Senior co-captain Sabina Van Mell, continued Tufts’ New England tour at Roger Williams in Bristol, Rhode Island for the Mt. Hope Bay Invite. The Jumbos again sent two teams, each with A and B fleets, and managed fifth and seventh overall finishes over the two-day weekend in the crowded, 15-team field. That didn’t stop the Jumbos’ second B fleet from storming away with multiple first-place finishes, while the top A and B fleets managed to snag a victory apiece over 12 races. Back in Massachusetts, Tufts competed at the Toni Deutsch ‘58 regatta, hosted by MIT and named after Toni Deutsch, the first female athlete to be awarded a varsity letter at the school. The Jumbos did more than just honor an athletic legend, as both their A and B fleets amassed totals of 83 points over 13 races. The A fleet secured a first-place finish in the eighth race, to boot, as Tufts finished sixth overall. The regattas will come thick and fast over the fall season, so there will be no letting up for Legler’s squad. Fortunately for the Jumbos, there’s a new influx of talent hoping to ease some of the pressure on the more experienced members of the team. Sophomore Jacob Whitney was equally impressed by the depth of talent present in the first-year class. Next week, Tufts will head up to Brunswick, Maine for the Nicholas Barnett Trophy. 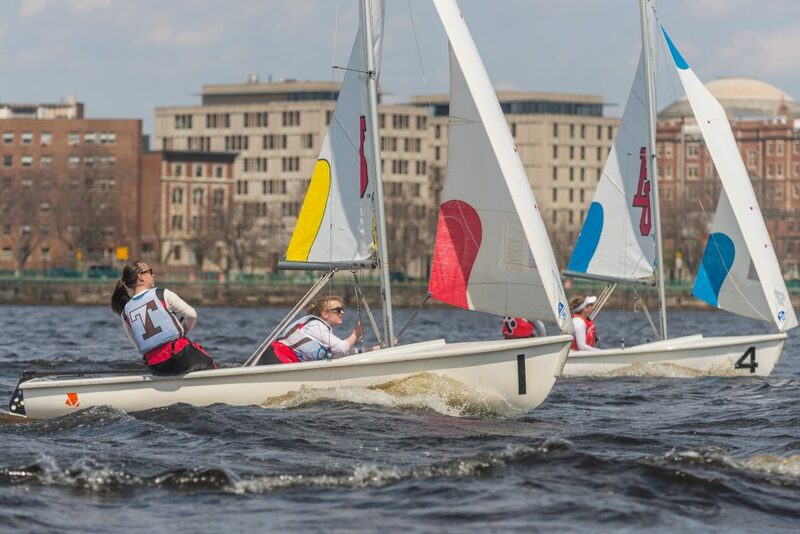 Both the co-ed and women’s teams will also be competing at the New England Single-handed Championship, hosted by Boston College. One risks getting clocked by the “boom” if they let down their guard on the season’s high-paced activity.